First, let me thank all of you for your patience as the Connecticut Granger attempts to improve distribution of the paper. Unfortunately, much of the trouble is beyond our control. A prime example of my frustration was the delivery of Brother Brian Carpenter’s January and February issues. Brother Carpenter received his January issue (let’s say) on a Friday and received the February edition the very next day. The February issue had taken just two days to arrive in Enfield (starting out in Winsted) while the January issue had taken well over ONE MONTH to arrive. These stickers do not indicate the class of mail, they only facilitate the delivery of the paper. The Granger is mailed under the “Periodicals” rate-- used by other newspapers/magazines. While it is difficult (if not impossible) to speed the paper through the Postal Service there are a couple of things the Granger can do to speed up delivery and to make sure news is received in a timely manner. First- the time between delivery from the printer and the delivery to the Post Office will be shortened as much as possible. However, there are months (especially during holidays) when the printer is shut down or the calendar otherwise prevents our normal printing schedule from being followed. The mail preparation of the Granger is a 6-8 hour process-- so finding enough time all at once to get this completed quickly is challenging at times. Second - we will permit Granges to submit calendar listings extending into the first half of the following month to make sure there is overlap. For example, for the April issue (Deadline March 5), Granges will be permitted to submit events for the month of April and the first two weeks of May. 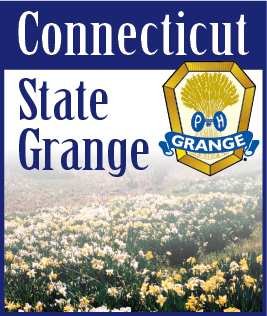 We hope this “overlap” will allow more members to get advance notice of your Grange’s events. You’re not alone! As Editor, I always send one copy to myself, so I can gauge when most members are receiving their copies. My January issue NEVER arrived, causing me to panic, but soon found out that most members (except Brian) had received their papers soon after mailing. As the Postal Services’ financial troubles continue to mount, service delays and consolidation of sorting/processing units will further lengthen the time in transit for all mail. Again, we thank you for your understanding and hope the steps we are taking will help the situation. Please, always feel free to contact me with your questions, comments, complaints, etc. We can’t improve if we don’t know there’s a problem!